Winter wonderland! Two snow storms while we were here, exactly what we were hoping for. What a gorgeous, gorgeous place! 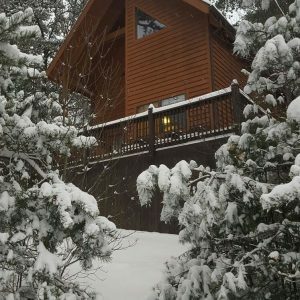 We loved the snow, we loved the cabin, we loved the area! We had a great time skiing and snow tubing. We so enjoyed retiring to the cabin and soaking in the hot tub each night and sitting by the fire! Our kids loved the loft with board games. Comfy cozy! We will be back!